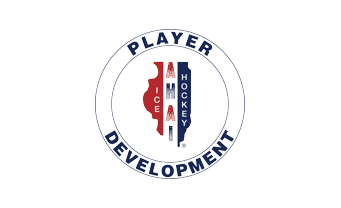 All Tier I, Tier II, Prep and High School Varsity players within the 2002, 2003, 2004 and 2005 birth years are eligible by invitation only for the 2019 Amateur Hockey Association of Illinois (AHAI) Player Development | Identification Tryout Camp held in Bensenville, Illinois, the weekend of March 22nd through the 24th. The process will start this month with an online ranking of each of the age appropriate players. AHAI has developed a web tool that allows ALL the Illinois Head Coaches, from each of the above divisions, to go online to rank ONLY those players they saw play during this season. The due date for these rankings will be early February. These Head Coaches will be ranking the “best” players from this State, NOT JUST THEIR OWN PLAYERS, within a specific birth year, by position, starting with number 1 as the best and so on down the line. After these online rankings are compiled by the web tool software (in a weighted average verses the number of votes a player receives) the AHAI Player Development Committee conducts a Web Tool Ranking Evaluation Meeting. This meeting will be held in February and will be broken into four different groups, for the four eligible birth years. During this meeting, which consists of the Player Development Committee members, along with select Head Coaches from Tier I, Tier II, Prep and High School Varsity, we will review the web tool rankings of the players. All nominated players are reviewed, in each birth year, in the order they were ranked, in an unbiased manner, regardless of what club/association the different Head Coaches are affiliated with. This process determines the final selection of players who are to receive an invitation to the AHAI Player Development | Identification Tryout Camp. The invitation goes out to 36 forwards, 24 defensemen and 8 goalies within each of the eligible birth years. After these invited players are selected, then this committee moves on (at this same meeting) to choose the alternate players, by birth year, by position and assign them in a ranked order of who gets presented with the opportunity to participate if an invited player can’t attend. Special Note: The AHAI Player Development Camp evaluators do not know who was an initially invited player and who was a selected alternate. All players are judged fairly on (only) their on ice skills and effort shown during this Player Development Camp. The players invited to attend the AHAI 2019 Player Development / Identification Tryout Camp will then be notified by AHAI by the end of February via email. They will be given 5 days to respond. If a player does not respond or cannot attend for any reason, the alternates will be contacted in their ranked order. Again, only Head Coaches within the applicable birth years will be able to nominate and rank the players from Illinois for consideration to participate in this year’s AHAI Player Development | Identification Camp.